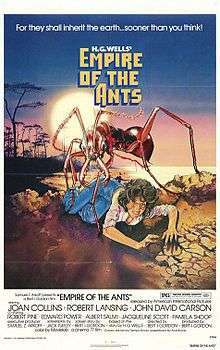 Empire of the Ants is a 1977 science fiction horror film co-scripted and directed by Bert I. Gordon. Based very loosely on the short story Empire of the Ants by H.G. Wells, the film involves a group of prospective land buyers led by a land developer, pitted against giant, mutated ants. It is the third and last film released in A.I.P. 's H.G. Wells film cycle, which include The Food of the Gods and The Island of Dr. Moreau. A heavenly paradise becomes a hellish nightmare when a toxic spill turns harmless ants into gigantic rampaging monster insects. The opening narration briefly introduces the viewer to the ant and its behavior. It takes note how ants use pheromones to communicate, and how they cause an obligatory response that must be obeyed. "But humans don't have to worry about that...." As the opening credits roll, barrels of radioactive waste are being dumped off a boat into the ocean. Eventually one of the barrels washes up on the shore and begins to leak a silvery goo attractive to local ants. Meanwhile, shady land developer Marilyn Fryser (Joan Collins) takes a bunch of new clients to view some 'beach-front property' on a nearby island. In reality the land is worthless, but the trip is cut short by the group stumbling upon the lair of gigantic ants. The ants destroy their boat and chase the group through the woods. Fleeing for their lives through the wilderness and losing many of their party along the way, the remaining survivors eventually discover the local island town. But their safety is short-lived when they realize that not only are the giant ants feeding on the local sugar factory, but that they are doing so at the behest of the humans. The queen ant, using pheromones, has the entire town completely under control, and the giant ants are determined to exterminate humankind and build an evil empire. However, the survivors manage to escape and burn the sugar factory, killing the giant ants, and leave the island by a speedboat. As with most Bert I. Gordon films, the director himself oversaw most of the special effects. To create the effect of giant ants, the director often used the technique of process shots, where close-up images of live ants were combined with images of the actors on set, reacting to the menacing insects. Another more crude effect used by Gordon was one he borrowed from his previous film Beginning of the End, where he would place live insects in a miniature set lined with still photographs of the location and let them crawl around. The shortcomings of this technique was highlighted in a scene where the ants are climbing the outside of a sugar refinery, and some of them appear to suddenly crawl off the building and walk vertically into the sky. When the film called for actors to be attacked by the ants, large rubber mock-ups were used, which were animated by crew members who wiggled the gigantic props in front of the camera. Joan Collins later said she did not like working with the ant props as they bumped and scratched the actors, including herself. ↑ Nowell, Richard (2011). Blood money : a history of the first teen slasher film cycle. New York: Continuum. p. 257. ISBN 978-1441124968. Retrieved 5 November 2016. ↑ Weiler, A. H. (June 30, 1977). "Movie Review: 'Empire of the Ants' A Snail's-Pace Film". The New York Times. Retrieved 2010-02-10. ↑ Schoell, William (2014). Creature Features: Nature Turned Nasty in the Movies. Jefferson: Mcfarland. p. 75. ISBN 978-0786495627. Retrieved 5 November 2016. 1 2 Weaver, Tom (2010). A sci-fi swarm and horror horde : interviews with 62 filmmakers. Jefferson, N.C.: McFarland & Co. pp. 382–385. ISBN 978-0786446582. Retrieved 5 November 2016. ↑ Jankiewicz, Pat (April 2001). "Damsel in Distress" (PDF). Starlog (285): 32–33. Retrieved 5 November 2016. Weaver, Tom (2010). "Robert Pine on Empire of the Ants (1977)". Sci-Fi Swarm and Horror Horde: Interviews with 62 Filmmakers. McFarland. ISBN 978-0-7864-4658-2. pp. 382-385. Wikimedia Commons has media related to Empire of the Ants (film).